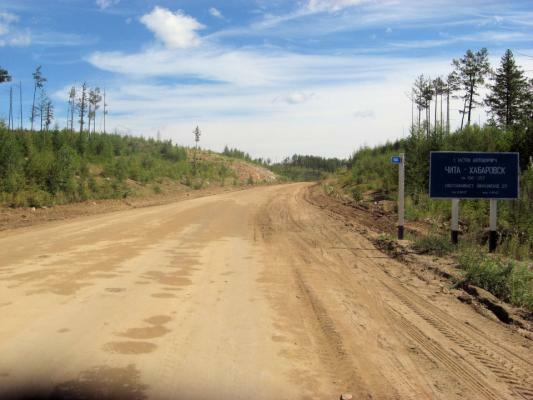 We started on gravel portions of the Amur Highway (also known as M58 or Чита-Хабаровск). 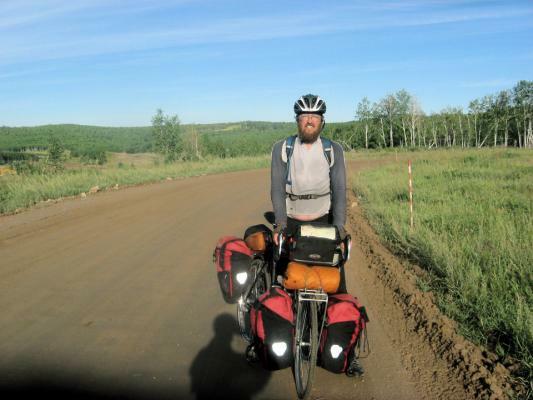 We had 57km of gravel and 38km of asphalt in a long ride. The gravel road is wide, but is a tougher surface to ride. There is a fair amount of washboard road and some areas with rocks protruding from the road surface. Sometimes I would shift from side to side looking for smooth parts, though often there weren’t any. The day started with a 3km climb, followed by a 3km descent. 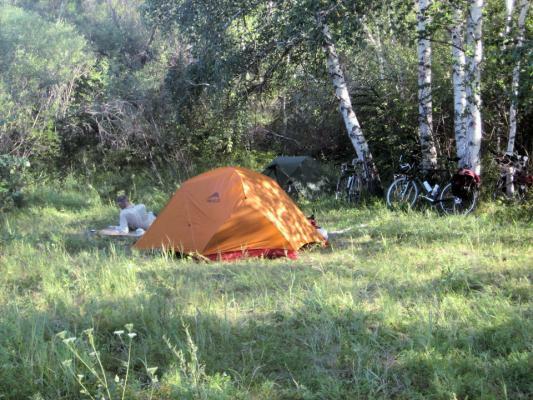 The road then followed a river valley with a cafe at 16km near intersection to Урульга. While it was an asphalt surface, the road was rough. From here we started a climb again and then some bouncing amongst hills. 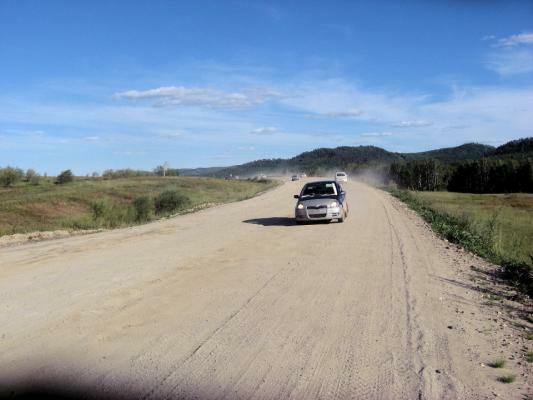 At 24km we saw signs for 9km of road construction, and the road turned to gravel. A kilometer later I stopped to celebrate 10,000km of cycling from Amsterdam. The gravel was wet and started to stick under my front fender. I tried riding the left side of the road as it was smoother. 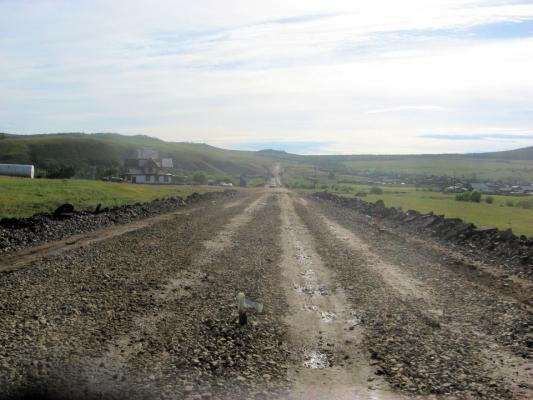 The road construction went down a hill and to a cafe at 32km across from Нарын-Талача. We stopped and ate plenty as we weren’t sure when we would next see a cafe. After this there was some more gravel to ride but my front fender was all gummed up. I stopped and decided to remove it. It now hangs on a 40km road construction sign. After this we had 14km of asphalt. Without much fanfare sign at 47km the asphalt simply stopped. We would see cars coming the other way. A majority had temporary “in transit” stickers from Vladivostok. It was a slow and bumpy ride. We stopped briefly at 66km at top of a hill for food and here we decided to try for 80-85km for the day. 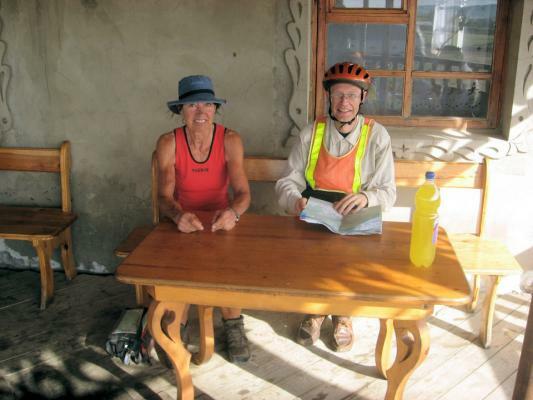 Bert and Mickey were ahead and at 81km we reached our designated bridge. A car told me they were ahead and that there was a cafe in 15km. Apparently someone had also told them, though they were told 5km. There was indeed a cafe at 94km. We filled up for end of the day before camping next to a bridge. This bridge was built in September 1995 so work on this road has been going on for a while. It was a long day but nice to finally get a start on some of the gravel.